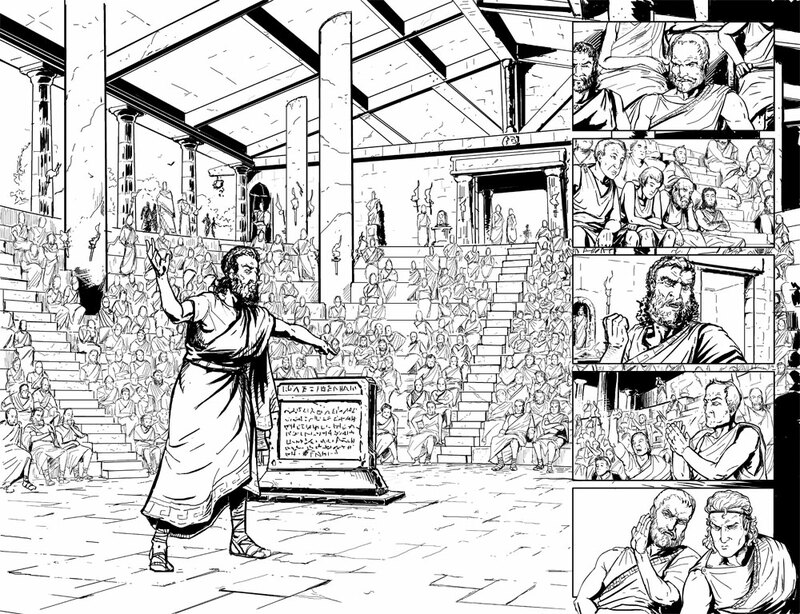 POLIS: The Trial of Socrates - Graphic Novel Update - First Colored Page! These pages are finally getting some color and dialog! 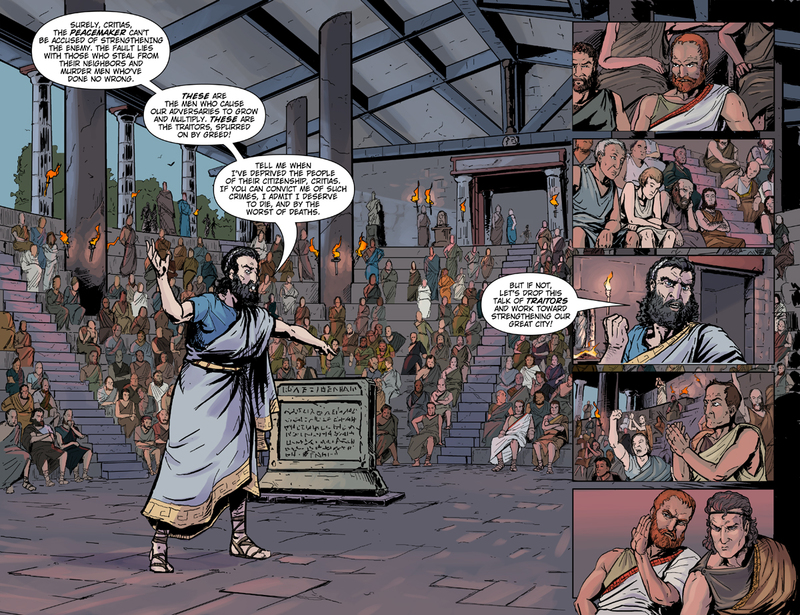 A historical graphic novel that examines the events that led up to the trial and execution of Socrates in ancient Athens. Previously I uploaded the inked page. 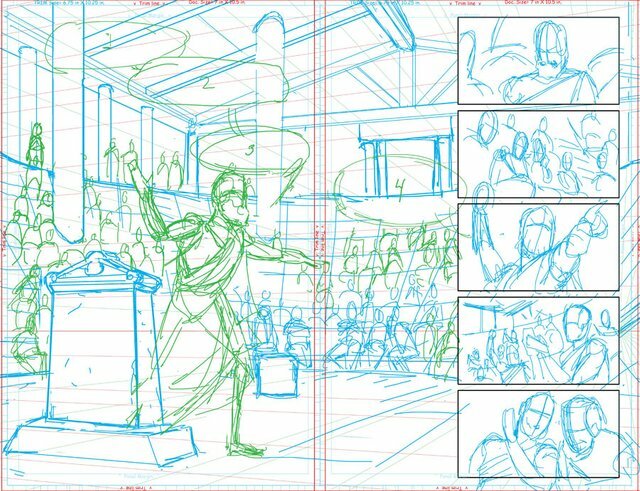 However, I'm now working with Luca Blugheroni for the coloring, and I wanted to show off the finished spread page. (I've done the lettering. I may hire a better letterer down the road once I get the book funded on Kickstarter.) What do you think?! 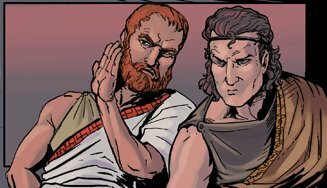 This is a scene that takes place in 404 BCE just after the Peloponnesian War has ended. Sparta installed an oligarchic government at Athens which severely restricted citizenship. Even this limited 3000 were controlled by thirty men who would come to be known as the Thirty Tyrants. Here, one of the Thirty, is trying to stop some of the more blatant offenses of the government. He points an accusing finger at Critias, the unofficial leader of the group. Thanks for your support and any feedback! Your upvote is definitely appreciated. I hope you'll stick around and watch it all come together. War between Greek city-states​ back then was all about democracy vs. oligarchy. Well now this is very interesting. :) Great concept for a graphic novel. It's a period of history I know very little about so I would read it just for that. That's definitely the hope. It's a fascinating period, and I'd like to see it more popularized and understood. I really love to see your work @jpgaltmiller . This novel looks really great too, Its been a long time since I read the book, both that and the last days of Socrates were very interesting reads. Nice u can try the tag #steem-cartoon too...good audience there. I've tagged some of my posts with #steem-cartoon, but for some reason I don't think I've done so with the Polis posts yet. I'll have to give it a shot. These look fantastic with the color! I personally don't mind the lettering but I know some people have very strong opinions about hand-lettered vs computer fonts. Thanks. There's no way I would go with hand-lettering. I haven't run into anyone who does that anymore. :) However, I do suspect a more professional letterer could add a little je ne sais quoi with their version. Oh really? That's so interesting, well if you ever find yourself looking for cartoonists who letter the old-fashioned way, I know a couple of people haha! Not me, I hate my hand-lettering with a passion. Thanks for continuing to check it out! You got a 50.00% upvote from @spotlight courtesy of @resteemable! You got a 4.70% upvote from @ipromote courtesy of @jpgaltmiller! Congratulations! This post has been upvoted from the communal account, @minnowsupport, by jpgaltmiller from the Minnow Support Project. It's a witness project run by aggroed, ausbitbank, teamsteem, theprophet0, someguy123, neoxian, followbtcnews, and netuoso. The goal is to help Steemit grow by supporting Minnows. Please find us at the Peace, Abundance, and Liberty Network (PALnet) Discord Channel. It's a completely public and open space to all members of the Steemit community who voluntarily choose to be there.